Square Enix is known for milking any series with the words Final and Fantasy, in the title. So imagine my surprise when they announced a new RPG for the Nintendo DS would be an original IP. The World Ends With You was developed by the same team who created the Kingdom Hearts series, but outside of some similar character designs it is quite a different departure. However there’s a reason why Square Enix tends to stick with time tested IP’s as original stuff sometimes misses the mark in a bad way. So is The World Ends With You another smash hit like Kingdom Hearts or do we have another The Bouncer on our hands? Shibuya. Always the hip happening place. 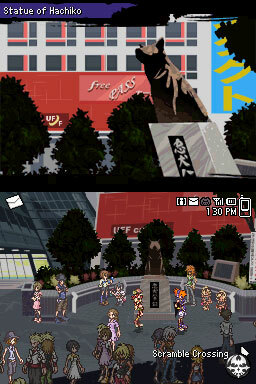 The World Ends with You is not your typical group of teenage stereotypes saves the world from evil forces storyline. It refreshingly takes place in modern day Shibuya, Japan and immediately introduces you to main character, Neku Sakuraba. He wakes up in a busy crossroad of Shibuya, voices in his head, little memory of how he got there and a text message on his phone saying if he doesn’t get to a certain area within 60 minutes he will face erasure. Brushing it off as a joke, he soon realizes it is real as a timer displaying 60 minutes appears on his hand. You soon learn that Neku is part of a game in which he and the other players are fighting for their lives against a group of people who call themselves Reapers. As you progress through the game the mystery slowly and slowly unravels itself never fully explaining itself until literally the last boss. This story is both simple at its core and incredibly deep and profound if you wish to explore it in depth. At its heart this game is a mystery novel that throws just enough questions at you to feel compelled to play more, but not so much that you get bogged down or confused. I can honestly say that I was surprised at the ending and even more surprised when I read the epilogue of sorts. Neku and Shiki are shocked to find they are sent on another kill quest. I found the characters to be really likeable. Each one has their reason for being part of the game and you really feel for them when you find out why it is. 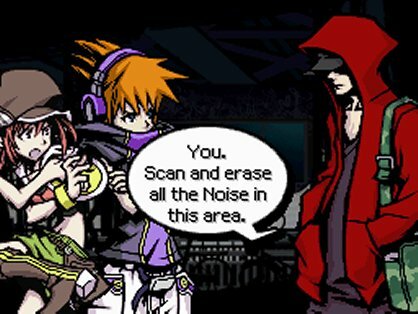 Neku in particular was a great example of how to make a Square Enix emo character. I felt he had great character development without feeling like they forced a personality change into him. I remember not being able to stand Neku at the beginning of the game and slowly over the course of the game found myself cheering for him. I also remember making a big fuss about how if the characters were older I could relate to them more, but eventually I realized that even though the characters are in their teens, they feel almost ageless so it really became a non-issue for me. Trust me, leave the AI on auto attack. 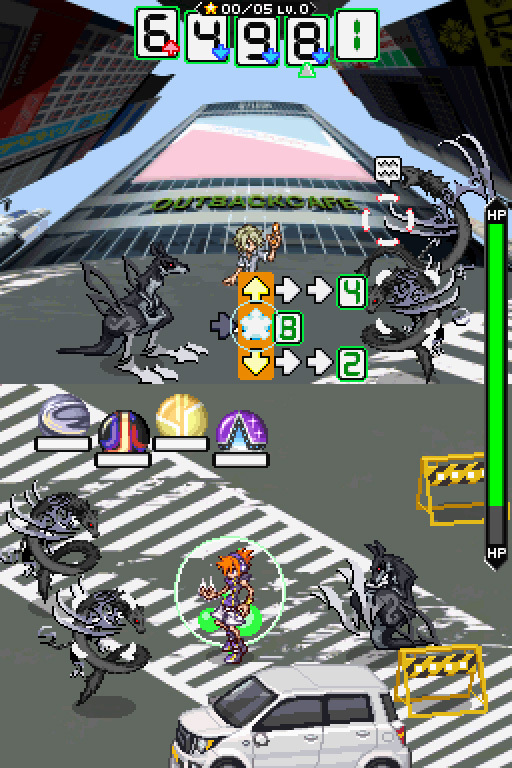 Gameplay wise, The World Ends With You uses unique ways to take advantage of the NDS. During battles you have both a top and bottom screen. 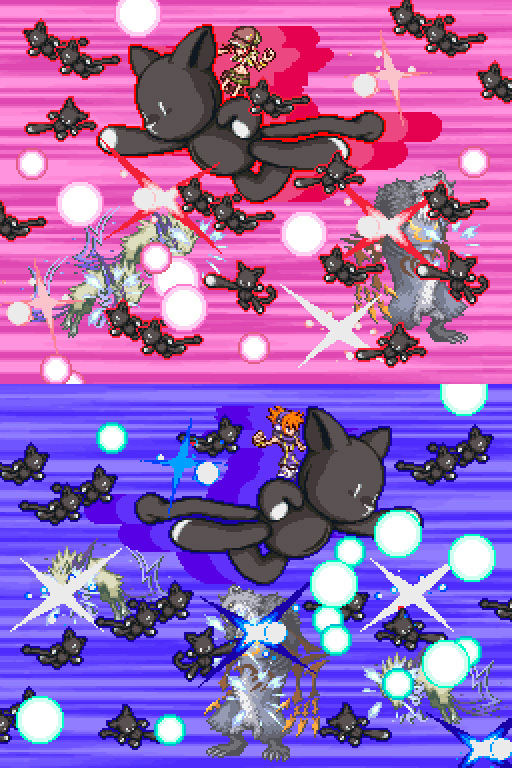 The top screen shows your partner and the bottom screen is Neku. You control both players at the same time with the d-pad controlling the top and touch screen based actions controlling the bottom. This initially starts you off with a huge learning curve as paying attention to both screens is quite difficult. Luckily you have the option of having the top screen go on auto-attack and honestly you never really have to control them. Utilizing different pins keeps a fresh spin on battling. 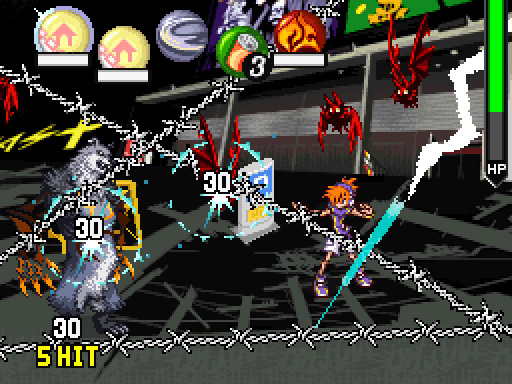 Neku must equip different pins in order to attack and that changes the way you interact with the touch screen. Some pins will make you slash with the stylus, some will make you tap the stylus and some even make use of the microphone. It’s great to see a game actually integrate the touch screen controls instead of feeling like they were tacked on. There are many other little gameplay touches that make the game feel unique, such as eating food to increase your stats, decreasing your levels and being weaker in order to get more pins to use, different clothing brands that reflect equipment and pins that get stronger or weaker depending on what style is hot in the area you are in, and even a built-in mini game that can be described as marbles on crack. Nothing screams out fear more than a barrage of giant stuffed plushes! After you beat the game you can come back and replay the chapters in the game to access additional storyline content. In addition there’s one mode where you play through a day with the characters as they exist in an alternate universe which ends up being really humorous. These do add a bit of replay value, but if you really just want the story and don’t feel like playing through the same game again, just do what I did and check out spoilers online. You’ll see how deep the storyline can really be for this game. Overall, I feel the Kingdom Hearts development team hit it out of the park with this one. It was refreshing that it broke many JRPG stereotypes and it goes to show that new IP can be a success if done right. I realize the game is over a year old by this point, but if you missed out on it the first time around I highly recommend you pick it up and add it to your DS collection. In the future, there was a nuclear war and as a result mankind developed the power of warp space travel. Using this power they were able to visit distant galaxies they call “Star Oceans”. Who will survive in a world of… STAR OCEANS! So that actually sums up the basic plot behind the game. This game is a prequel to any other Star Oceans and stars off with World War III nuclear strikes ravaging Earth and decimating it’s population. Soon after mankind looks to space for survival and five ships are tasked with colonizing a new planet. You play a crew member from one of those ships named Edge Maverick (parents must have got the name from a list of generic space heroes). Non-fantasyesque story. The first thing I noticed is how vastly different the feel of the game is from Star Ocean 2, the only other Star Ocean game I played. Where Star Ocean 2 felt more fantasy than sci-fi, Star Ocean 4 feels defintely more sci-fi than fantasy. So people who are looking forward to a JRPG that breaks the typical storyline mold shouldn’t be disappointed. Battle pace. First off no random battles makes me a happy camper. Two new mechanics, blindsiding and rush, help break up monotonous button mashing. Blindsiding allows your character to sidestep around an enemy to get a free guaranteed critical strike in. Rush is like a super meter that, when full, can be activated to get increased stats for awhile. It’s definitely something new and makes battles feel more dynamic and like a fighting game-like. The dubbing. 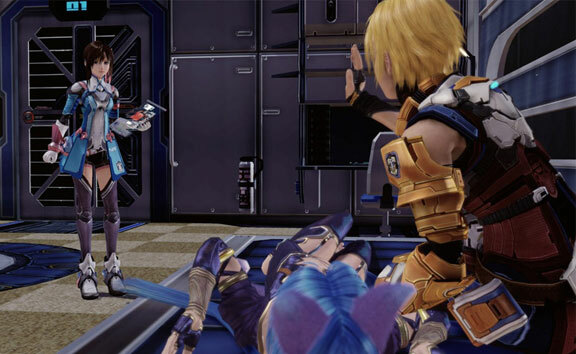 I know that JRPG’s can have good dubbing as made evident by Tales of Vesperia and Eternal Sonata, but I would rank Star Ocean 4 even beneath Infinite Undiscovery! (Listen to Welch and tell me this isn’t true). It makes it even worse when you hear the same two victory quotes after every battle. However even Infinite Undiscovery’s dubbing grew on me so we’ll wait and see how it pans out. Lots of story, no action! Like most JRPG’s, there is a lot of exposition you are given before you get to actual gameplay and when you do it suffers from what I like to call “I don’t know where to go next”-itis in which sometimes you’ll be wandering around for a long time before you figure out the next trigger for the storyline. This has always been a huge pet-peeve and I hope that it doesn’t happen as often in the future. Generic characters. Yeah the overall story is cool so far, but the characters you play as have felt very flat and one-dimensional. I’m hoping that we see some actual depth to these characters as the story goes on. If you’re looking for another JRPG to get sucked into, you could do a lot worse. However with stuff like Eternal Sonata, Tales of Vesperia and Persona 4 out there you could also do a lot better. If you RPG’s that break the mold of the traditional fantasy world (not to say it doesn’t have it’s fair share of swords and sorcery) I would definitely say give it a try. If you already got your plate full with other new releases I think it can be passed for now until a drop in price.